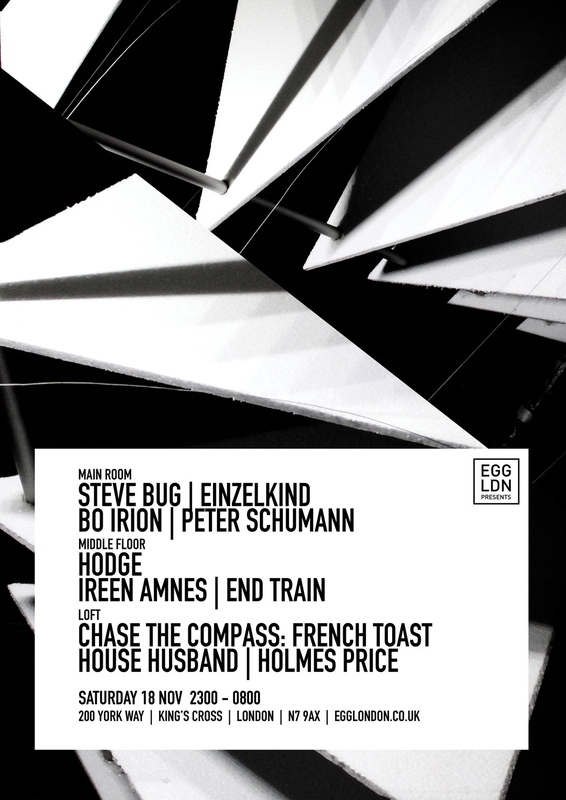 Respected bastion of techno music Egg London are excited to announce the debut set from the legendary German techno DJ/Producer Steve Bug who is flanked by sterling headliners Einzelkind, Bo Irion and Peter Schumann. A legend in the electronic dance music scene Steve Bug is hugely respected for his mesmerising DJ skills but also for his groundbreaking label Poker Flat responsible for launching the careers of the mighty Trentemoller, Mihai Popoviciu and Guido Schneider. Part of the Cocoon family Einzelkind who’s currently enjoying huge props for his Ibiza flavoured missile, ”Free Savioni” Amnesia Pearl Mix also makes his debut at Egg London tonight. Joining Einzelkind is Kater Blau’s Peter Schumann who is known for his minimal grooving beats and vinyl only imprint, Platte International. Bo Irion, resident at Berlin’s Tanzhaus West and Dora Brilliant clubs is completing the line up for the Main Room. Middle Floor sees the inimitable Bristolian techno act Hodge whose releases on Livity Sound, Hotline Recordings and Hemlock Recordings has quickly gained him huge recognition within the dystopian borders of Techno. He will be joined by End Train and Ireen Amnes who is bringing her Under My Feet. project back to Egg London. Loft sees London based Chase The Compass bring their house, disco and techno flavours..